Sometimes the past appears in the present pulling the present into the past like the motion of an accordion. That happened for me last night at a very moving presentation of Dubois’ “Seven Last Words of Christ” at Mount Calvary Lutheran Church in Excelsior, Minnesota. The sanctuary was full and darkened, lit primarily by seven candles in front of the bare altar. The choir was full. The organ, the drum, and the harp were near perfection, as were the four professional soloists and the choir itself. As each “word” was completed, one candle was extinguished and, for the finale, the choir sang in the dark without music. No one broke the silence in the end as we left. For me, it was not just beautiful. I relived the years of singing one of the soprano solos in Hamden, Connecticut. But more than that I saw and heard the conducting organist, long gone from us, and the other friends no longer in my life, and many gone on to the next stage in their journey. The day before yesterday we had celebrated Maundy Thursday where we received the new commandment to love one another. Yes, the accordion effect last night did flood my soul with love that survives even the death of those who have blessed our lives and moved on. I’m excited to say that I’ve found the ideal person to do the cover for “Figs & Pomegranates & Special Cheeses,” the reedited version of “Mrs. Job.” It will portray Dara’s move from Nomad to Royalty — emphasizing the love story aspect and using the colors of her family’s expertise in weaving as a kind of frame. There’s one thing I like, but I need feedback about. 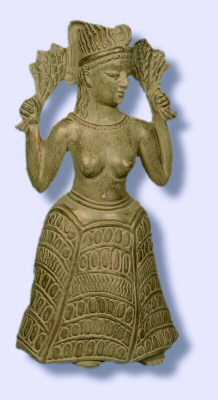 She has introduced a little Astarte in the lower corner, reflecting the conflict in the story as Job demands that Dara give up her devotion to Astarte in favor of his God. I’m concerned that some potential Christian readers might find it offensive. I’d appreciate opinions. And I’ll be able to make this more specific as the design progresses. For the header today I’ve chosen a piece of a photograph of the area of Petra (Edoms’ locale) taken by friends Babs and Camille. The whole thing is, of course, much more attractive, but I have to fit the scale allowed for a header.